The scholae were possibly created by Diocletian, but since Constantine abolished the Praetorian guard he may have been the one responsible for their creation. We don't know their original strength but later each scholae unit was 500 strong (Codex Justinianus IV.65, XXXV.1). All scholae are cavalry units. Originally there may have been but three, but this was soon expanded. The west had 5 scholae, the east had 7, but we know that the Scola gentilium seniorum later returned to the west. The schola units were also known under numeral names, independent of their official names. For example the scola scutatorium quarta is therefore not a short-lived scholae unit, but most probably the scola scutariorum clibanariorum. From the 5h century onwards this is a normal way of describing the scholae units, while we encounter the official individual names mostly when officers careers are described. Unfortunately, although the shield designs of many late Roman units are shown in the Notitia Dignitatum, this does not seem to be the case for the units of the scholae. The scholae were directly commanded by the emperor, and were usually stationed close to his person. We know from the 6th c. that the scholae were stationed in towns outside Constantinople, and this may have been the rule for the time before. Scholae recruits received high pay, annonae civicae, were freed from recruitment tax (privilegiis scholarum) and had excellent career opportunities (see below). The recruits for these units were first and foremost barbarians. In the 4th century we see especially Franks and Alamans in the west, and Goths in the east. Officers have Germanic names or are identified as such: Silvanus and Mallobaudes (armaturae), Malarich (gentiles) were Franks, and Ammianus tells us these were especially represented among palace guards as well as the scholae units (Ammainus Marcellinus XV.5.11). Agilo and Scudilo (scutarii) were Alamans, Gomoar, Bainobaudes (also scutarii) and Balchobaudes (tribune of the armaturae seniores) were at least western Germanics. Arintheus (armaturae) will have been a Goth. Nestica and Barzimer (tribunes of the scutarii) were Germans, whereas Bacurius (tribune of the scutarii sagittarii) was a king of the Caucasian Iberians. Also in the lower ranks we encounter many Germanic names. During the 5th century the eastern scholae were especially filled with Armenian recruits, while from the time of Zeno recruits were especially Isaurians. Apart from the non-Roman background, we can also find evidence that recruits had to be physically excellent. Being tall and good-looking was certainly a good thing if you wanted to serve in the scholae. The scholae guards had shoulder-length hair, after the German fashion, and received especially quality and highly decorated arms and armour. Synesios of Cyrene described them (negatively) as slender young men with long thick hair, smelling of perfume, carrying golden lances and shields. We encounter them also on the Theodosian missorium and the Ravenna mosaics: bare-headed, torqued, with big fibulae and decorated shields. A modern reconstruction of scholae guardsmen (Minervii, Germany). A well-known soldier from the scholae is St. Martin of Tours who served under Constantius II and under the Caesar Julian. The famous scene with St. Martin and the beggar outside Amiens can therefore be pictured during Julians campaigns in Gaul. Martin soon afterwards entered the priesthood, which is not especially surprising when one thinks of the attitude that Julian had towards Christians. But there may be more to it. Ammianus described that Julian had only a personal guard of 360 soldiers when he went from Milan to Gaul. And apparently these soldiers were good for nothing, because Julian is said to have remarked that they werent proper warriors, but only able to pay (Zosimus III.3.2). While the scholae palatine units ranked highest among the units of the Late Roman army, the scutarii ranked as most prestigious (while oldest) among the scholae. The commander of a scholae unit was originally a tribune (tribunus scutariorum) but from the 5th c. we encounter a comes scholarum, which seems to have been a promotion. Theres a law from 413, stipulating that scholae tribunes who were promoted to Comitivia primi ordines during their service, ranked upon discharge as high as the Dux of a province. Not bad for a military career. 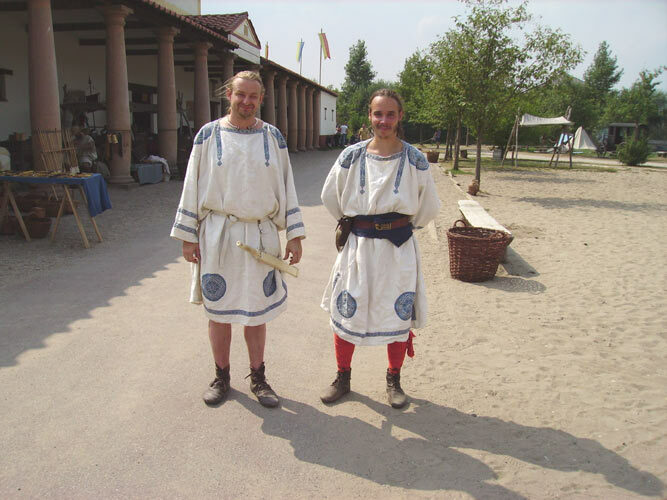 The commanders of scholae units were also much favoured with commanding units of the field army, since the Late Roman army did not know either army groups or the commanders of army groups. Since therefore no officers existed between the tribunes and the regional commanders (comes domesticorum or magister peditum/equitum), a scholae commander could be among the first in line to command detachments of the field army. The scholae continued to be the core of the army, cradle for the best officers, until well into the 5th c. or even into the 6th. Many tribunes made it to dux, comes or magister militum. However, when the emperors ceased to accompany the forces into battle, the corps slowly became an army within the army looking for personal gain more than promotion in battle. Of the western scholae we hear next to nothing after the Notitia Dignitatum. They were disbanded as guards by Theodoric the Great, but continued to exist in a (non-defined) role, possibly as city guards in Ravenna, because a scutarius turns up in several property documents of the 6th and 7th century. It was already Leo I (457-474) who created a new corps, the 300-strong excubitores. These men, presumably real soldiers, became the real bodyguard of the emperor, displacing the scholae. Ammianus Marcellinus: With an English translation, ed. and trans. J.C. Rolfe, 3 vols., (Loeb Classical Library, London/Cambridge 1935, repr. 1971-2). Ammianus Marcellinus: Res Gestae Divi Augustae, full text (Latin): http://www.gmu.edu/departments/fld/CLASSICS/ammianus.html. Zosimus': Historia Nova, tr. unknown (1814), ed. Roger Pearse, in: Early Church Fathers - Additional Texts, at: http://www.ccel.org/p/pearse/morefathers/home.html (scroll down to page bottom for Zosimus). Hoffmann, Dietrich (1969): Das Sp�tr�mische Bewegungsheer und die Notitia Dignitatum, 2 vols., Epigraphische Studien 1, (Rheinisches Landesmuseum Bonn). Nicasie, Martijn (1997): Twilight of Empire, the Roman Army from the Reign of Diocletian until the Battle of Adrianople, (Thesis Publishers Amsterdam). Southern, Pat and Karen Dixon (1996): The Late Roman Army, (Routledge). Woods, David (1996): The Scholae Palatinae and the Notitia Dignitatum, in: Journal of Roman Military Equipment Studies 7, pp. 37-50.